Last week, I saw amazing whole wheat banana coconut muffins on one of my favorite blogs, Cookie and Kate. Ever since then, I couldn’t stop thinking about trying to make a gluten-free version. And voila…I DID IT. I used coconut flour instead of whole wheat flour based on a gluten-free banana muffin recipe from Elana’s Pantry. These babies are SUPER moist too. But first, let’s have a chat about fat. Good fat that is…not just cute baby sausage leg fat. I’m talking about good fats in the foods that we eat. The fat free craze that took over the nation created a fear of fats that is unjustified. The food industry began taking out real ingredients and injecting fillers and sugars to replace the fats. Buying no fat items does not mean that it is healthy, this is a bit of a myth….go for whole foods and you’ll be good and much more satisfied! Look on the ingredient list. If it says it is no or low fat, and there are more than five ingredients and you can’t pronounce most these ingredients….it’s not a real food. 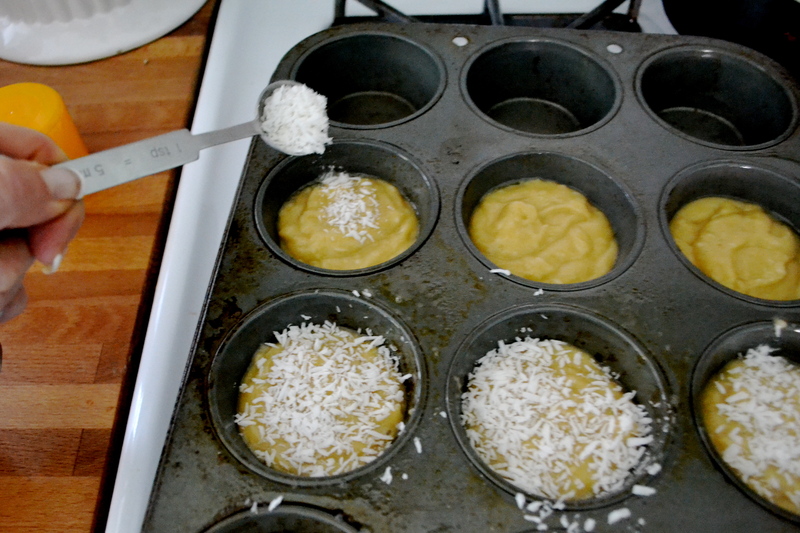 These muffins have triple coconut in them…coconut oil, coconut flour, and shredded coconut. If you look at the nutritional facts of this muffin, there are approximately 130 calories, 7 g of fat, 2 g protein, and 3 g of fiber! Let’s get real about coconut and the good fat that it provides. Coconut Oil – contains saturated fat, but in the form of medium-chain triglycerides (or MCTs) which are easily digested, absorbed, and utilized in the body. This is because these molecules are smaller than those from long-chain triglycerides (or LCTs), which are the type of fat normally consumed from plant and animal sources. Basically, MCTs require less energy and fewer enzymes to break down for digestion, making them an excellent choice of fat for active people and athletes as MCTs digest immediately to produce energy and stimulate metabolism (instead of carb loading!). They are also ideal for those who suffer from digestive disorders and are often given in hospitals to provide nourishment for critically ill people who have trouble digesting fat. SO eat up! And it’s tasty too. Coconut oil is also stable at high temperatures and is the best oil to be used for high heat cooking. Coconut Flour – High in fiber, high in protein, and a great gluten-free substitute for flour. You can easily find coconut flour at your local grocer in the health foods section or Whole Foods, of course. Bob’s Red Mill is the brand that I use. Even if you are not gluten free, you can add coconut flour to regular whole wheat muffins or baked goods to add extra protein and fiber into your recipes. But seriously folks. Despite these being really healthy and good for you, I really think these are my favorite muffins ever….hands down better than any other muffin (including the fresh blueberry muffins from Cook’s Illustrated). I’ve made two batches in one week. 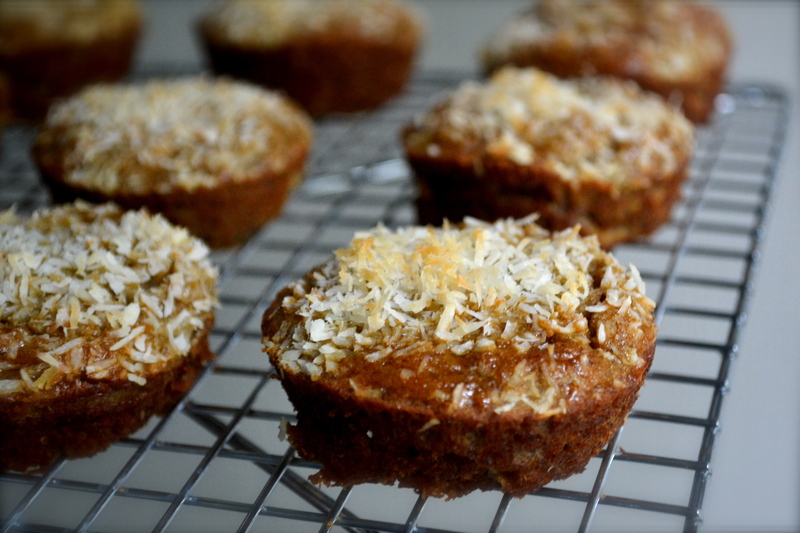 Note: If you have a good food processor, use it when you prepare these muffins….cuts down on tons of prep work. 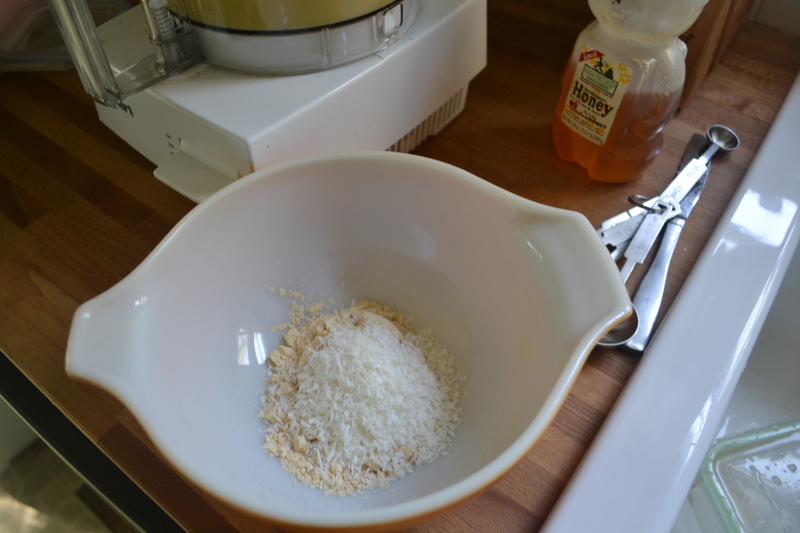 Otherwise you can do this by hand (just takes a little more elbow grease) or with a stand mixer. Preheat oven to 350F. Set a rack in the middle of the oven. Spray 9 muffins tins with nonstick spray or apply coconut oil inside the tins or line with muffin liners. Set aside. Add bananas, eggs, applesauce and vanilla to the bowl of the food processor and blend until well mixed and a liquid consistency (about 1 minute). Meanwhile, heat the coconut oil in a microwave safe bowl in the microwave for 30 second intervals until melted. Add the honey or agave nectar to the melted coconut oil. Mix until combined. With the mixer or food processor turned on and mixing, pour the coconut oil/honey mixture through the feed tube into the banana mixture. This helps keep the coconut oil from solidifying. Add coconut flour, baking powder, and salt to the mixer or food processor. Pulse or mix for about 1 minute until well combined and no lumps exist. 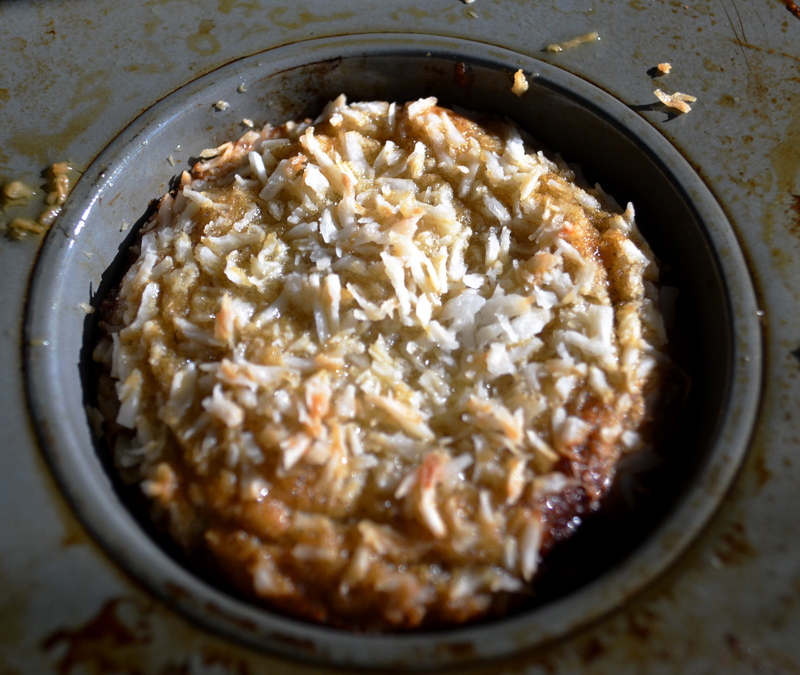 Stir in 1/4 cup shredded coconut. Pour mixture into 9 greased tins, filling 3/4 full. 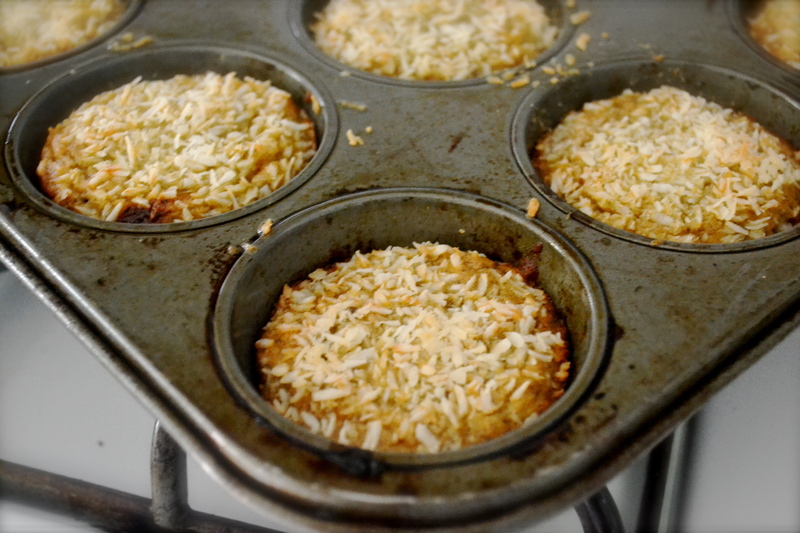 Apply 1 teaspoon of shredded coconut on top of each muffin. Bake in middle of the oven in a preheated oven set at 350 for 23 to 28 minutes (takes me 26 minutes). Keep an eye on the coconut topping. Allow to cool in the muffin tin for about 5 minutes. Then remove and cool on a wire rack (if you can keep from eating the whole pan). Love these, Alyssa! Way to go! I seriously need to try coconut flour. I already had one of my banana muffins for breakfast and now I want one of yours for a snack. Oh yea! These are moist & delicious! I added Enjoy Life mini-chocolate chips.. even better! Hubby said “these taste too good to be healthy”. Oh yum! These are my husbands favorite muffins. The applesauce is used in place of oil or butter. So if you don’t have any, then you could increase the oil content. I bet microwaving an apple then oureeing it in the food processor would work too, but I have never tried it. Good luck and let me know how it goes!